As I was making my way from Minneapolis to Rochester, I decided to break the 16-hour trip in two and spend two days in Chicago. The Windy City had been figuring on my list of places to visit in the United States for a while so I couldn’t pass on the opportunity to explore its picturesque streets bordering the Chicago River, admire its architecture and try deep dish pizza. Chicago could keep you busy for days, but with so much to do and so little time to experience it all, I focused my time on exploring the city’s best attractions. So if like me, your time in the city is limited, here are the best things to do in Chicago on a weekend getaway! The Chicago Riverwalk is probably the first place that comes to mind when thinking of the city. Bordering the main branch of the Chicago River, the trail takes you on a 1.6 km walk in the heart of Chicago. As you make your way towards Michigan Lake, expect great views of some of the city’s most iconic buildings such as Marina City and the Merchandise Mart, as well as live performances in the summer. The path is open from 6 am to 11 pm and the entrance is free. Speaking of iconic buildings, did you know why Chicago is home to some of the most innovative and experimental constructions?! The Windy City actually owes its grandeur to a tragic event, the Great Chicago Fire. Destroying thousands of buildings in 1871, Chicago then became an architectural laboratory for architects from all around the world. To get a glimpse at some of the designs that made the city’s reputation, stay downtown and wander the streets in the Loop neighborhood. My favorites include the bright red Flamingo on W. Adams Street, the Cloud Gate in Millennium Park and the Art Deco Carbide & Carbon Building on N Michigan Avenue. If you don’t have a lot of time in the city, I would highly recommend prioritizing going to the Willis Tower Skydeck to get a panoramic view of the city from above. Besides being able to see most of Chicago’s main landmarks in a few seconds, the experience of stepping on a glass platform on the 103rd floor of a skyscraper is in itself worth the detour. I’m not afraid of heights but I must admit that my legs felt a little weak as I walked onto the platform and looked down. Expect to wait about 45 minutes to get up to the skydeck and another hour to stand on the platform. The Willis Tower is open from 9 am 10 pm March through September and from 10 am to 8 pm October through February. General admission costs $24. What better way to discover the city than from the Chicago river?! If you’re short on time (and even if you’re not), book an architectural boat tour to get a unique perspective on the city and learn about Chicago’s skyscrapers. The tours last an hour and a half and cost $47. If you’re looking to capture beautiful pictures of the city, they have a special tour for photography enthusiasts on Saturdays and Sundays at 9 am. Located downtown in the Loop neighborhood, Millenium Park is the place to go to escape the city’s craziness… and check off The Bean or Cloud Gate off your Chicago bucket list. Its closeness to the Navy Pier and the Lakefront trail makes it the ideal picnic spot so enjoy a break under the city skyline to recharge your batteries before keeping exploring Chicago. Commonly referred to as The Bean due to its shape, the Cloud Gate is one of Chicago’s most beloved landmarks and I get why. The way the city’s skyline is reflected on its surface makes for a good time and great photo opportunities. Get closer and watch your reflection get distorted as you walk under it. Located at the entrance of the park, across the street from the Chicago Cultural Center, you’ll have no troubles finding it. Try to go early as it tends to get pretty crowded during the day. Right behind The Bean you’ll find the Jay Pritzker Pavilion, a gigantic outdoors bandshell with a capacity of 11,000 people. More than an open-air scene, the structure truly is a work of art and blends perfectly with the surrounding buildings. Luckily when I was there the Orchestra was rehearsing and I could experience its incredible acoustic. Sit on one of the surrounding benches and stick around for a bit! Don’t miss out on the Art Institute of Chicago, one of the largest art museums in the United States. The Institute has, between others, the best collections of Impressionist and Post-Impressionist paintings (my favorites!) outside of Europe. Calling all fans of Monet, Renoir and Cézannes’ work out there, this is a mandatory stop. The museum is open every day from 10:30 am to 5 pm and on Thursdays until 8 pm. General admission costs $25. Feeling spendy?! Walk down Michigan Avenue and do some shopping on the Magnificent Mile. Stretching from the Chicago River to Oak Street, the 1 km lane features many luxurious brands, fancy hotels, and gastronomic restaurants. For high street brands and more affordable finds, head to one of the malls bordering the mile: Water Tower Place, 900 North Michigan and The Shops at North Bridge Entrance. One of the best things to do in Chicago in my opinion after visiting the Riverwalk and Millenium Park is biking along Lake Michigan. If you follow the Lakefront Trail far enough, at least until Adler Planetarium, you’ll reach the Skyline Walk and will be rewarded by a breathtaking view over Chicago. I personally rented a city bike across Millennium Park for an hour. The advantage is that you can pick it up and drop it off at different stations and it costs $3 per 30 minutes. The Field Museum is not only one of the largest Natural History Museum in the world but is also since the end of May the new home of Máximo, the largest dinosaur ever discovered. The titanosaur was uncovered in Argentina and is 37 meters long and 8,5 meters high! Fear not as you picture a night at the museum scenario, Máximo lived on a plant-based diet over 100 million years ago in Patagonia. Basic admission costs $24. As you make your way back to the center, drop your bike off at the Navy Pier. Shops, restaurants, rides… take your pick. If you’re with kids, don’t miss out on the kids’ museum. Overall the Navy Pier is a great family attraction but if you’re not looking to spend much time shopping or on the rides, go for the view of Downtown Chicago and get on your way. The Chicago Cultural Center is a must do in the Loop. The entrance is completely free so just walk in and enjoy the exhibitions. With its two beautiful stained-glass domes, the building itself is worth a visit. At times, they also host free theater events, lectures, and screenings so if you’re interested, check out their events calendar before you go. The Center opens daily from 10 am to 7 am and on the weekend until 5 pm. Similarly to High Line in New York and the Coulée verte in Paris, Chicago also repurposed an old elevated railroad and transformed it into an elevated greenway. The Bloomingdale Trail or The 606 stretches over 4,3 km and goes through the neighborhoods of Logan Square, Humboldt Park and West Town. I didn’t have the time to check it out but I’m sure it’s worth the detour if you have a bit of time to spare. Chicago is a beautiful city that will surprise you at every corner so close maps.me (Read more: 10 Travel Apps You Need to Download Right Now) and just walk. You’re bound to encounter great architecture, restaurants and bars. Get your camera out, cross the bridges again and again and let the exploration begin! Have you ever been to Chicago? What were your favorite places? 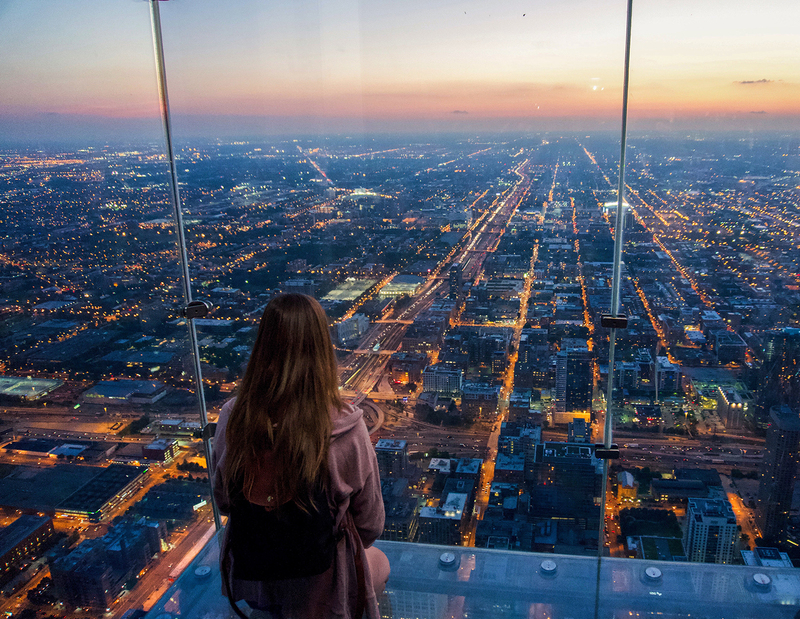 Would you step on the Willis Tower Skydeck?! I’d love to hear about your recommendations so please let me know your thoughts in the comments section! Heading to Chicago soon?! Pin the article for later! A city of sckyscrappers, so a lot to see from above. Of course a skydeck is a common choice. Thank you! Honestly, I thought the Cloud Gate was overrated but it’s a really nice monument that blends surprisingly well with its surroundings! You’re welcome! It should definitely be 😊 It’s also a good way to locate everything in town! It’s truly stunning 😍 Then you might wanna go in the summer to make the best of it! Chicago is my adopted city – moved here more than half my life ago. You really nailed the list of things to do in my fair city, with one notable exception – YOU DIDN’T WRITE ABOUT EATING PIZZA LOL!!! 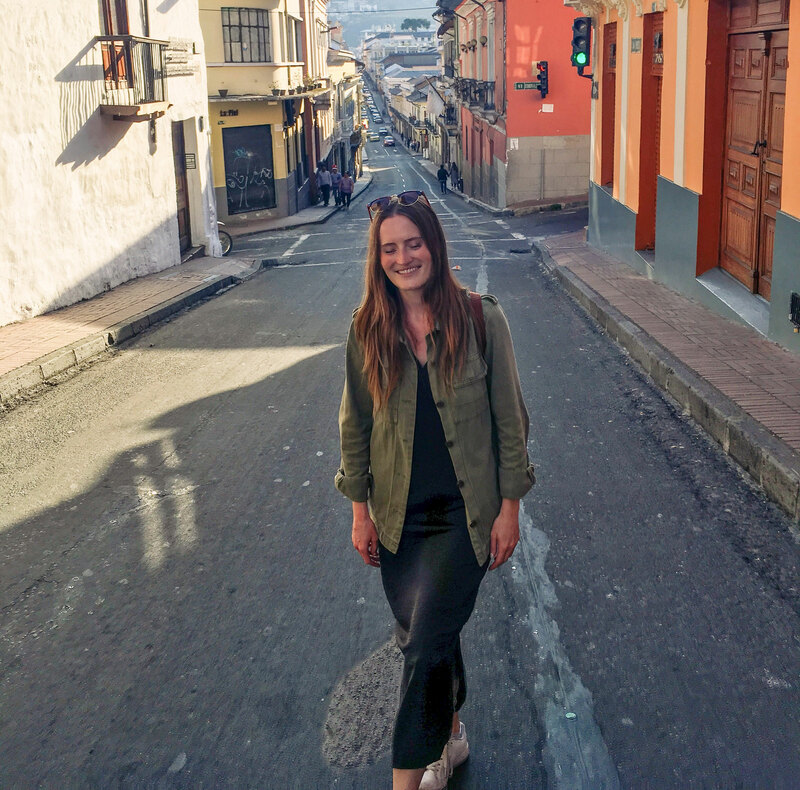 Great post, thank you for such favorable and fun coverage of my favorite city in the world. Haha, I know! 🍕 I was debating whether or not to include it and then waiting for someone to mention it so thank you for bringing it up! I loved spending time in your beautiful city.